Before a reported one million street revellers, the London South Bank University (LSBU) bus debuted the University’s new, dedicated campaign championing the support and inclusion of the LGBT+ community, bringing to the fore the important role of educational institutions in promoting equal rights. 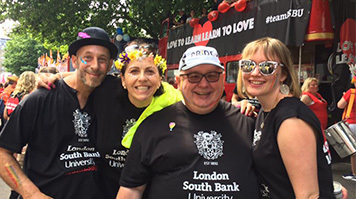 LSBU has taken part in the parade for the past five years, and this year 120 LSBU staff, students and allies marched in the parade, in shirts and wristbands emblazoned with the ‘Love to Learn, Learn to Love’ message. LSBU Chief Operating Officer Ian Mehrtens said: “This year’s parade marked 50 years since homosexuality was decriminalised in England and Wales, and while we have come a long way in half a century, there is still more to be done to ensure that people of the LGBT+ community are treated equally in terms of being supported and included by all, regardless of sexuality or gender identification. “London South Bank University is a welcoming place and since we began as Borough Polytechnic in 1892, our mission has remained the same: to provide professional opportunities to all who seek them. “‘Love to Learn, Learn to Love’ perfectly sums up our commitment to quality educational experiences for our students, by providing a supportive and inclusive environment which enables people to become what they want to be. Learn more about LSBU’s recognition as one of the best places to work in higher education for lesbian, gay, bisexual and trans people.